It takes a lot to startle fans of bitcoin, the digital gold of the moment. But Wednesday was, well, a lot — a wild run of exuberant peaks and white-knuckled declines that left even diehards breathless. The dizzying rally in bitcoin, a bull market with few precedents in investing history, was abruptly interrupted by a market outage in the U.S. that seemed to captivate Wall Street even more than the day’s selloff in high-flying technology stocks. 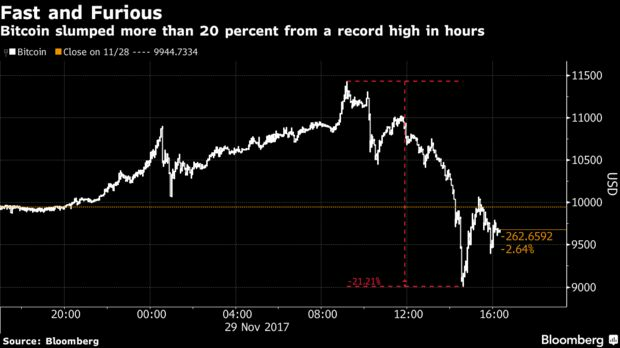 Only hours after soaring past $11,000 — a price that represents a gain of more than two-fold since September — bitcoin plunged nearly 20 percent in less than 90 minutes. Whether the swoon represented a brief setback or the start of something worse, the wild ride underscored just how volatile the cryptocurrency has become in what some warn could be one of the biggest bubbles of all time. The day started with a touch of frenzy in the air, as the digital currency took its first trip past $10,000 and yet another celebrity — this time, pop icon Katy Perry — tweeted about her fascination with the rally. But things suddenly seized up during U.S. hours when traffic swelled on on-line exchanges. Confusion reined in the market for hours. Investors fearful of missing out on the frenzy were greeted instead with service outages and delays. Coinbase tweeted that traffic on its platform hit an all-time high at eight times the peak demand experienced in June. Access remained unavailable to some users. The selling reached furious levels shortly after 1 p.m. in New York, when bitcoin fell back below $11,000 and didn’t stop until $9,009. It hovered just below $10,000 as of 4:30 pm. For many, the retreat was overdue after bitcoin had rallied 20 percent in just four days in a run-up that drew increased warnings it was headed for a sharp retreat. The cryptocurrency ended September at $4,171.25. 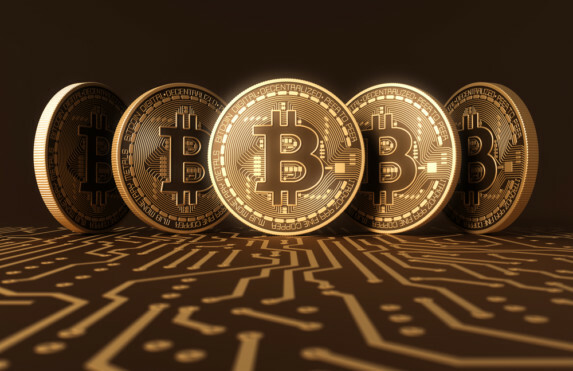 Proponents have heard those warnings for years, and watched bitcoin’s price rise 935 percent this year alone. Those kind of gains have grabbed Wall Street’s attention, evident Tuesday as buttoned-up financiers and analysts piled into CoinDesk’s cryptocurrencies conference in Manhattan, turning the event into a standing-room-only affair. Still, Wednesday’s jarring reversal had Spallanzani reminding investors that the ride down might not be over, at least for now.